"Because these wallpapers tend to be in neutral tones, like shades of gray or terra cotta, they can be an easier pattern for couples to decide on." "This wallpaper offers a relatively bold take on faux wood paneling and would look just as good on a piece of furniture as on a wall." "This updated take on a floral print incorporates rich green tones and colorful birds." "This loose plaid print has the friendly feel of a picnic blanket or old-fashioned tablecloth, making it perfect for the hub of your home." 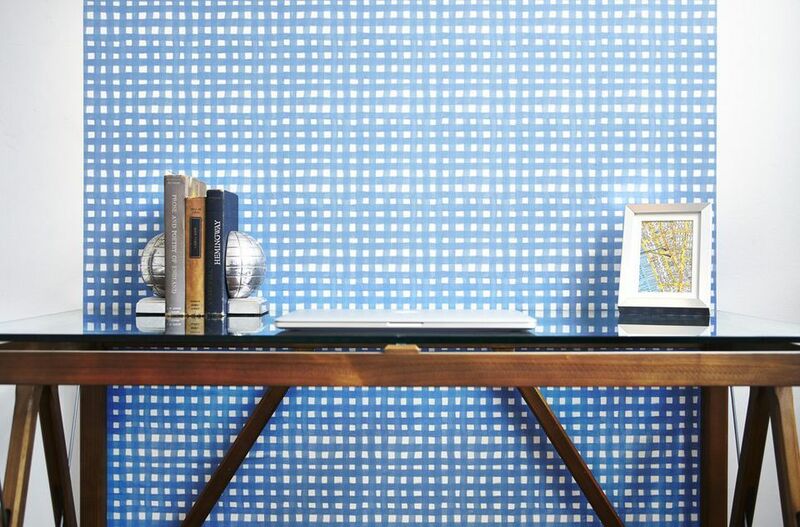 "Temporary wallpaper with a large-scale pattern can fill a big wall and make the space feel instantly complete." "Updating the space with a bold, cheerful print can make the chore of doing endless loads of laundry just a little more pleasant." "This happy rainbow-and-cloud print works for girls' and boys' rooms, and...it will work for your child far beyond their time in the crib." "This trendy pattern feels cool but not too young. It's sophisticated and playful at the same time." Many of the most popular removable wallpaper prints are inspired by architectural details, like wood paneling, brick and stone. And it’s no wonder, since these are classic ways to introduce a pattern and texture into your home. If your home is modern and lacks character, using a peel-and-stick wallpaper with a cool pattern can give it instant personality. And because these wallpapers tend to be in neutral tones, like shades of gray or terra cotta, they can be an easier pattern for couples to decide on than some of the wilder prints out there. A white and gray tonal shiplap wallpaper is a modern take on the farmhouse look. The faux wood grain moves horizontally to act like a stripe, a familiar shape for people who might be a little afraid of pattern. And since it’s pale and subtle, it’s hard to go wrong in any interior! While removable wallpaper is not as expensive as traditional wallpaper, the costs can add up if you’re covering a larger area, like a full room or even a large accent wall. And any decorating project is an investment of time as well as money, so if you don’t expect to decorate again for a while, you might go for a “safer” option than you would for a quick fix. An adhesive wallpaper in classic, neutral tones will stand the test of time and cost about the same as a couple gallons of paint, with a more sophisticated effect. This wallpaper offers a relatively bold take on faux wood paneling and would look just as good on a piece of furniture as on a wall. It’s Amazon’s #1 Best Seller in the wallpaper department, and that reflects the universal appeal of the warm gray wood grain that can be run either vertically or horizontally. A powder room — often located on the main floor of the home and used less frequently than the master bathroom — is ideal for experimenting with wallpaper! Because the rooms are small and used less often, you can go for a bold pattern here without worrying that you’ll get sick of it soon. Many people consider this a spot to really show off their personalities, so feel free to indulge in a wild floral, cool animal print or high-contrast geometric design. This updated take on a floral print incorporates rich green tones and colorful birds for an un-fussy take on a botanical print. The kitchen is a surprisingly fun place to experiment with color and pattern. First of all, in many kitchens the cabinetry covers most of the walls so you actually don’t have that much wall space to work with — which means you’re less likely to get tired of a bolder pattern since you see much less of it. It’s also a space that tends to be more friendly and casual than, say, a formal living room or dining room, so many people feel more free to play with wallpaper here than in other rooms. For a kitchen, look for a small-scale wallpaper that will let you see the full design in small areas, like the backsplash between the upper cabinets and the countertops. You might even consider using it to line the backs of glass-front cabinets. This loose plaid print has the friendly feel of a picnic blanket or old-fashioned tablecloth, making it perfect for the hub of your home. In a large room, like a family room or bedroom, adding wallpaper to just one accent wall can create a focal point that defines the room. Often used as an alternative to a big piece of art or a big headboard, temporary wallpaper with a large-scale pattern can fill a big wall and make the space feel instantly complete. Because you’ll be seeing this print over a large area, consider a pattern that’s a little more classic in style, or perhaps a two-tone design that will give you more room to play with other furnishings. A metallic print can be a particularly good option since it will read as a neutral but still add interest to the room. Consider a geometric print as an updated take on a full wall of wallpaper that won’t be anything like what you would have found at Grandma’s house. The laundry room has become a popular space to add wallpaper. And why not? Updating the space with a bold, cheerful print can make the chore of doing endless loads of laundry just a little more pleasant. Plus, this is a space that guests typically don’t visit, so you can have as much fun as you want without worrying that someone might question your decorating sense. The laundry room can also be a good place to experiment with a new pattern or to get a spouse used to the idea of incorporating wallpaper into other rooms. Once you see how much you love it here, it will be easier to take the leap into other spaces! This fresh take on a geometric print will elevate and laundry room, and blue and white are classic colors with a broad appeal. With the impending arrival of a baby comes that nesting instinct — and the desire to decorate the nursery is strong! Many people love the look of pastel hues, baby animals and other sweet motifs for a nursery. In soothing, happy colors, these can make the room where baby and parents will be spending a lot of time a pleasant place to settle in. This happy rainbow-and-cloud print works for girls' and boys' rooms, and because it isn’t as baby-oriented as some other wallpapers, it will work for your child far beyond their time in the crib. Young people love to assert their independence, and decorating their bedroom with an offbeat print will make them feel with-it and unique. Here, let your child take the reins. Let them experiment rich colors, bold prints, and tongue-in-cheek motifs that you might secretly wish you could put in the master bedroom! This trendy pattern feels cool but not too young. It's sophisticated and playful at the same time. Because it’s black and white, it feels bold as a decorating choice, but it works as a neutral to blend in easily with furnishings of any color or material. And because it’s a smaller-scale print, it leaves room for artwork, posters, or wall hangings of many varieties and can morph from one design style to another as your child’s tastes change.